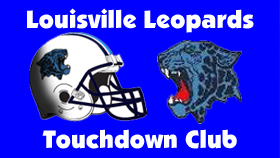 The Louisville Leopards Football Team earned their first victory of the season against the visiting Green Bulldogs 31-20 Friday Night at Louisville Leopards Stadium. With the loss, Louisville improved to 1-2 on the season. Runningback Max Hartline carried the ball 22 times for 161 yards and 2 touchdowns to lead the Leopards on offense. Quarterback Colton Jones came off the bench to complete 10 of 15 passes for 169 yards and threw a pair of touchdowns to Davis Burick. Both offenses struggled at the outset as neither team scored during their combined 8 first quarter possessions. Blake Robbins recorded the first of 2 sacks on the night for LHS to help put an end to Green’s opening drive. The Bulldogs punted three times and the Leopards punted twice in the opening twelve minutes. Louisville also failed to convert on fourth down twice. The first came after a bobbled snap when dropping back to punt and the second attempt came later in the quarter on a 4th-and-13 from the Bulldogs 28. Two plays before that Mathie found a toe-tapping Ryan Pukys in the left corner of the endzone for a 23 yard touchdown. But it was wiped away by an ineligible man down field infraction. Green broke the ice just 47 seconds into the second quarter when Quarterback Kage Williams rolled to his left and connected with Wide Receiver Dylan Runion for a 13 yard score. The touchdown capped a 10 play, 71 yard drive that began with 2:32 remaining in the first quarter. Williams would finish the night 18 of 32 passing for 133 yards through the air. The Leopards offense failed to get a first down on their next series and faced a 4th-and-7 at midfield. A fake punt pass gained only 6 yards giving the ball back to Green with good starting field position. Louisville’s defensive line took over on the ensuing drive and set the tone for the rest of the contest. After a Bulldogs first down, Jason Goard and Maverick Pugh stormed into the backfield for a sack. On second down, Goard launched out of his left end position quickly forcing the Bulldogs quarterback to his right. Linebacker Cam Lingle came up to deliver the boom for another loss. Two plays later, Green faced a 4th-and-16 at midfield and elected to go for it. Goard pushed off two blockers and slammed the Quarterback down for an 8 yard loss. The Leopards offense took over on the Bulldogs 48. Jones came off the bench and fired a bullet to Zuppe for a gain of 38 on his first play out of the gate. Two plays later, Burick faked inside and then blew by the defensive back. Jones delivered a perfect 12 yard pass that knotted the game at 7-7 with 7:19 left to play in the second half. Louisville finally got a bounce to go their way on the ensuing kickoff. Travis Pape’s kick hit just feet away from the home sideline and took a Leopard bounce back toward the middle of the field. Lingle was there to halt the returner quickly and Green started from their own 12. Four plays later, Goard and Pugh began closing in from both sides forcing Williams to leave the pocket and roll to his left. Seconds later Defensive Back Dillon Rebuck stepped in front of the pass attempt and picked it off at the 42 yards line. With a host of blockers in front of him, Rebuck rumbled to the Green 8. Pape, who got the party started with his kickoff, would end up booting a 20 yard field goal to put the Leopards ahead 10-7 with 3:52 to play before halftime. The Bulldogs took the lead back on the next drive. Williams scampered 71 yards to pay dirt on a quarterback draw play to put the visitors in front 14-10. Williams also led his team in rushing with 16 carries for 138 yards. Green further seized momentum when Isaac Kinaitis picked off a Leopards pass at the Bulldogs 43 yard line to halt the last Louisville drive before halftime. That momentum didn’t transfer into the second half as the Leopards came out of the locker room swinging. The defense forced a 3-and-out and the offense flipped the field on two plays. Hartline ran left for a gain of 22 and Jones found Burick for a 26 yard reception to the Bulldogs 16. However, another promising Louisville drive was killed by a turnover. Linebacker Matthew Amison and Lineman Andrew Peel combined to strip the Leopards ball carrier and Lineman Ben Timmerman pounced on it on the GHS 12 yard line. However, the relentless Louisville defense returned the favor on the Bulldogs next drive. Carter Rode and Zuppe combined efforts to strip the Green ball carrier and Pugh recovered the fumble at the Bulldogs 33. The Leopards went to the ground game pounding with Hartline on 6 of their 7 plays on the following drive. Hartline powered through a pair of defenders and used the blocking of the left side of the line in Cameron Norquest and Josh Stafford for a 3 yard touchdown run and a Louisville lead at 17-14. After a defensive stop, the Leopards offense put together another scoring drive in the third quarter. The 8 play, 86 yard drive ended with Jones delivering a perfectly placed pass over the hands of the outstretched defender and into the hands of Burick at the 12 yard line. Burick brushed off the defender and ran the remaining distance required for a 35 yard touchdown reception on 3rd-and-7. Louisville took their 24-14 advantage into the final period. Midway through the fourth quarter, Green inched closer with a controversial 1 yard touchdown run by Porter Flinn on 4th-and-Goal. The initial call from one referee had Flinn down short of the goal line sending the Leopards defensive front into celebration. But that call was overruled and the touchdown stood despite a valiant effort by the Louisville defense who had faced 1st-and-Goal from the 3 to start that final sequence. The extra point kick failed though leaving the Leopards ahead 24-20. Although they scored, the drive was a costly one for the Bulldogs as it required exactly 7 minutes of clock to travel 59 yards on 19 plays. The Leopards continued to chew the clock on offense with 5 straight Hartline runs to open the drive. Hartline plowed through the defense gaining 22 yards and a pair of first downs. Louisville was unable to go any further and punted the ball back to Green who then started from their own 11 with 2:34 to play. Just two plays into the final drive, Leopards Defensive Lineman Riley Brendle popped the ball free of its carrier and Lingle covered it on the Louisville 17. Hartline ran a sweep to the left, received a key block from Burick, and walked into the endzone unscathed on the next play. The touchdown sealed the Leopards first victory of the season and their 627th since Louisville began playing football in 1924. UP NEXT: The Leopards will next host the Lake Blue Streaks on Friday, September 14 at 7:00 PM at Louisville Leopards Stadium. Freshman and JV will travel to Lake next week with Freshman playing on Thursday, September 13 at 5:00 PM and JV playing on Saturday, September 15 at 10:00 AM.